On August 30, Mellah sent senior correspondent John Honeyman from Toronto, Canada to Marrakesh, Morocco on a rug buying trip. Over the next 4 weeks Mellah will be publishing his dispatches from the cities and souks of Morocco. See below for Part 1. Mustafa and I are driving down the new toll highway from Casablanca airport to Marrakesh at 140 kilometers an hour. Mustafa chain-smokes Marlboro Reds, and he steers with his knees. We are in a shaking Dacia Logan—a Moroccan assembled piece of machinery from the Romanian subsidiary of Renault, that, in the words of former Renault CEO Louis Schweitzer, was designed to be “modern, reliable and affordable—everything else is negotiable.” We go as fast as a Dacia Logan goes. Mustafa had offered to pick me up the airport. My flight from Montreal arrives at 7:00am, so that means he must leave Marrakesh before 5:00am to meet my flight on time. I had tried to decline his offer and take the train instead, but he insisted. By the time I clear customs, immigration and a long wait for my luggage, it is 9:00am. He has been waiting. He greets me with an embrace and a kiss on each cheek, and carries my suitcase to the car. I do not know Mustafa very well. He’s a vendor who owns a small shop in the Marrakesh medina who my wife and business partner Mir and I met on the last day of our first buying trip, back in January. 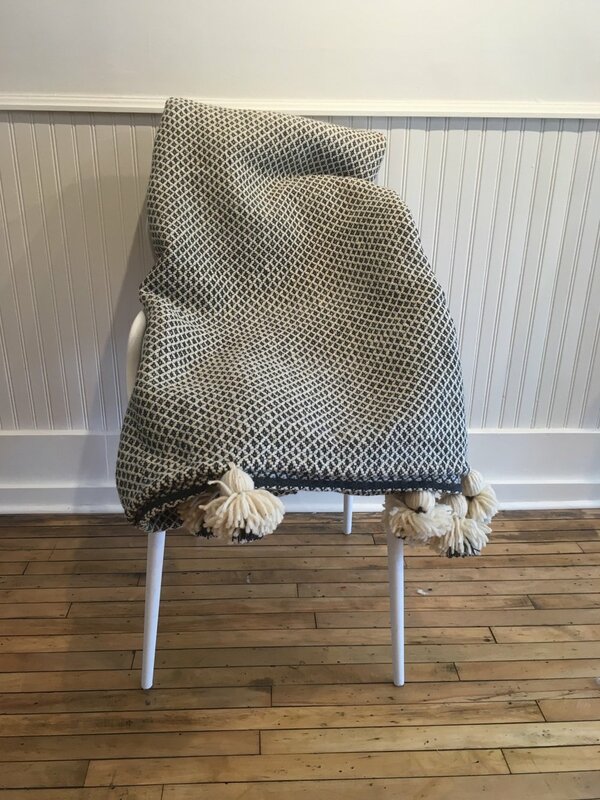 Mir, who has a superior eye to mine, was attracted to the herringbone patterned, lamb's wool pom-pom blankets that hung in his front window. We were worn down from battling hustlers and tough negotiations on that trip, so we were quick to warm to Mustafa’s laid-back and trustworthy vibe. The blankets sold well, so we re-ordered a few times over Whatsapp, the lingua franca of modern traders. Mustafa is a Moroccan, but he is also a German. After he graduated from the American school in Marrakesh, he moved to Berlin to study linguistics. This was in early 1990, just a few months after the fall of the Berlin Wall and the reunification of Germany. He lived there for 26 years before moving back to Marrakesh to be closer to his mother. His two brothers died unexpectedly within a year of each other and he did not want her to be alone. Mustafa’s apartment in the modern, European part of Marrakesh is cluttered but clean. Black and white ethnographic portraits of tattooed Berber women wearing jewelry are hanging on one wall. On another, a framed and yellowed front page of the Chicago Tribune. The headlines from that day seem historically unimportant, but I never ask Mustafa of the artifact's significance. Above the newspaper, there is a print of a John Lennon painting and a stiff artist’s jacket with Pollock-like tendrils of color. The second bedroom is full of antique tribal rugs, capes, dresses, and wooden doors stacked high. Mustafa is a true scholar of his Berber heritage, and, like all scholars, is obsessed. Before I have even put my bags down he begins explaining the pieces in his living room. His accent when he speaks English affirms the years in Germany—the effect is rather like a film about Berber rugs narrated by Werner Herzog, in which Werner Herzog will try sell you the rugs at the end. In next week's installment of FROM TORONTO TO MARRAKESH: CHRONICLE OF A MOROCCAN RUG BUYING VOYAGE, John Honeyman delves deep into the old city of Marrakesh.